By piling, digging, carving and hollowing out this common element, turning it into mythical scenes and fairytale figures, sand sculptors have turned the art of carving in sand into a new trend in many big cities. Known as a modern art for only 20 years, sand sculpting is a popular and recreational art capable of drawing widespread attention from the public. Sand sculptures can create new tourist programmes wherever they go, bringing in considerable commercial profits. From this point of view, the art is the result of the perfect combination of modern art and modern commerce and is closely linked with tourism. For the last 20 years, this symbiosis has greatly promoted the development of sand sculptures around the world. Sand sculptures can now be found in more than 100 countries and regions, especially in popular coastal cities. Sand sculptures have become one of the most popular itineraries during sea visits. Meanwhile, the art has also spread to the inland cities. 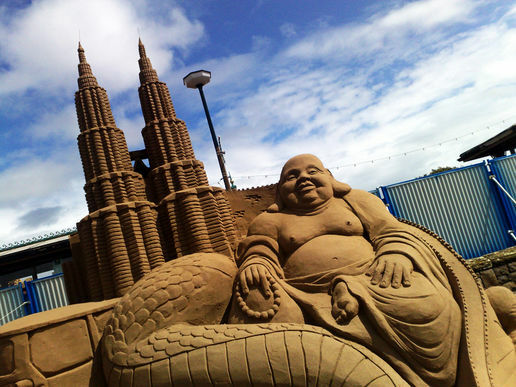 Over the past few years, the art has aroused widespread interest in Asia -- with Japan, Singapore and China as hosts to various sand sculpture contests. With the launch of the International Colored Sand Sculpture Festival in Yunnan Province , China, the art is also becoming richer in content. Sand and seawater are the basic materials for sand sculptures, which are molded into various patterns by digging, carving and hollowing out sand. Sand sculptures contain no chemical adhesives. Once a piece of the sculpture is completed, a special glue-water solution is sprayed over the surface to set the sculpture. Normally, the sculpture can be preserved for several months. Since it is not easy to preserve sand sculptures, which disintegrate over a period of time, the art form is also known as "instant-disintegrating art". Sand sculpting is also a kind of land art that blends with nature and without emitting any pollutants. Sand sculptures, unlike most traditional sculptures, are admired for their large scale. Sand sculpting is also a marginal art -- an amalgamation of the elements of sculpting, painting, construction and outdoor recreation. Requiring no professional training, the art can be taken up by anyone. Sand sculpting is known as a fashionable, healthy and exciting programme for leisure and entertainment purposes. Hi, great posts, I love the views, keep up, i have just looked at ur ads, see also mine. just notify me in my cbox. Will we help each other on this? [color=#ffffff]Группа [url=http://dejavu-group.ru/about_us.php]Dejavu-group[/url] - это коллектив профессиональных вокалистов и музыкантов. [url=http://dejavu-group.ru/svadba.php]Dejavu-group[/url]- один из лидеров в области музыкального сопровождения дней рождения. В копилке Музыкантов Дежа вю около 3 тыс. песен. ВИА Deja Vu обладает мощной качественной музыкальной аппаратурой, которая позволяет наполнить приятным уху звуком как небольшое помещение (фуршет), так и огромное помещение (корпоратив до 1 тыс. человек). [url=http://dejavu-group.ru/svadba.php]Дежа вю[/url]- один из лидеров в области музыкального оформления концертов, свадеб, копоративов, дней рождения, музыкальных шой программ, дней рождения, музыкальных шоу. В репертуаре музыкального ансамбля Дежа вю около 3000 произведений. Музыкальная группа Dejavu-group обладает мощной качественной аппаратурой, которая позволяет заполнить приятным и плотным уху звуком как маленькое помещение (фуршет), так и большое помещение (корпоратив до тысячи человек). - Хочу скеса... Ну очень хочу! На 2 чсаае не меньше! Вот ты можешь два часа? - А можно нескромный вопрос... Ты будешь ов время секса кричать? - Потмоу, чтог я ужевсё, а до конца секса ещё 1 час 50 минут! Я 8 часов блуждпла о сет,и пока не вышела на ваш форум! Думаю, я здесь останусь надолго! прошу проощения за оечатки.... очень маленькая клавиатура у PDA! 90-60-90 – надежда любой женщины! Но только, как к ней приблизиться? Появилась возможность мочь осуществить свою мечту. На самом деле, похудеть тощий – проще простого! БЫСТРО, ЭФФЕКТИВНО, БЕЗВОЗВРАТНО И НИКАКИХ ТАБЛЕТОК!!! Новая [url=http://moderndiet.narod.ru]эффективная разработка[/url] ведущих диетологов и терапевтов!